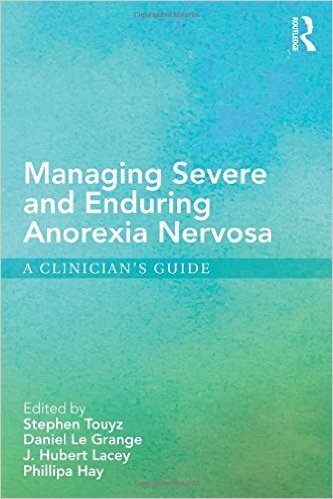 Severe and enduring anorexia nervosa (AN) is probably the greatest challenge currently facing eating disorder clinicians. A new volume edited by Drs. Touyz, LeGrange, Lacey, and Hay provides a valuable new resource for approaching the treatment of people with severe and enduring AN. The book is organized conceptually around a trial that was conducted in Australia and recently published (Psychol Med. 2013; 43:2501), which reported on a comparison of cognitive behavioral therapy (CBT) versus use of Specialist-Supportive Clinical Management (SSCM) for patients with AN. The study enrolled individuals with AN with a mean duration of illness of 17.7 years. Improvement was seen in both groups, which underscores both the potential for recovery in long-lasting AN and the need for a book of this sort. The book discusses specific strategies for clinicians who encounter such patients, such as the use of CBT, the use of SSCM, and the use of medications. There is also coverage of relatively unique topics highly pertinent to this group. Examples include the role of hospitalization, the role of involuntary treatment, and how and when one might contemplate palliative care. Finally, one major question when treating such individuals is what causes AN symptoms to persist and to be resistant to intervention, and both of these are covered as well. This is a relatively short, highly readable, and valuable volume that will guide eating disorders clinicians working with people with severe and enduring AN. Clinicians working with this group of patients often feel discouraged and uncertain about how to proceed; this book emphasizes the fact that there are ways forward.